These two historic hotels were constructed by the Great Northern Railway as part of their “See America First” campaign that enticed wealthy travelers to put off the traditional Europe tour in favor of visiting wild western landscapes. The Glacier Park Lodge, located adjacent to the rail depot in East Glacier Park, Montana, opened in 1913. More than fifty miles to the north, the Many Glacier Hotel followed suit in 1915. Both hotels were expanded shortly after they opened in order to meet the strong demand for rooms and are, today, rambling structures with exteriors reminiscent of Swiss chalets. The steep hipped roofs, railinged balconies, and wooden siding are painted the deep brown of a shadowy forest that is so common to national park buildings in the Rocky Mountains. I stayed first at Many Glacier. The sprawling, 212-room hotel dominates the shore of Swiftcurrent Lake, yet the surrounding mountain peaks dwarf the building. This was my first time spending the night here, though I had visited the lodge on my one previous trip to Glacier, back in August of 2008. A pouring rain that day masked the peaks across the lake, and visitors sought shelter in the lobby of the hotel. 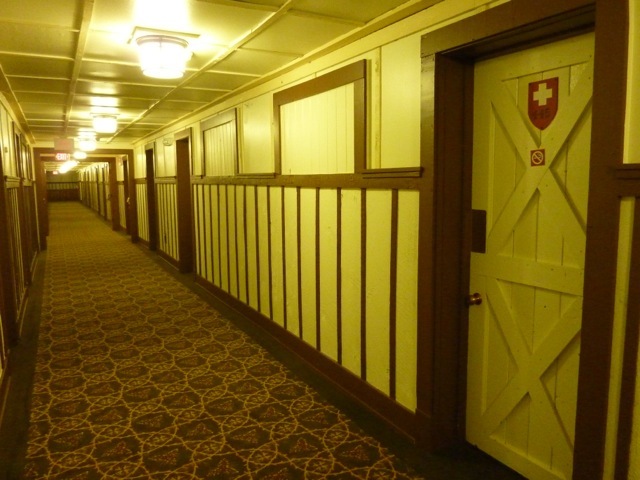 My partner Dave and I ventured down a long, white corridor to get to the dining room for lunch; the white doors to the guest rooms were festooned with little red shields painted with Swiss crosses and the room numbers, and the dining room itself had a white dropped ceiling hung with festive banners sporting coats-of-arms. In the four years that passed since that visit, my memories of the building had dwindled to clouded impressions of a crowded, shabby-genteel reception room, and an overwhelming whiteness to the decor. I arrived at the hotel and was surprised at how big it was, and that not everything inside was white. I felt especially gratified that restoration efforts by the Park Service had removed the dropped ceiling in the Ptarmigan Dining Room. For the first time since the 1950s, the restaurant now has an airy feel, open to the timbers that support the peaked roof. The renovations also exposed more of the magnificent native stone fireplace and chimney at the far end of the room. Massive Douglas-fir columns in the lobby of the Glacier Park Lodge, dating from 1913.
feeling of being in a mighty open forest turn out to be topped with smaller paired logs that formed Ionic capitals. The room is curiously charming in its contradictory architectural tendencies. 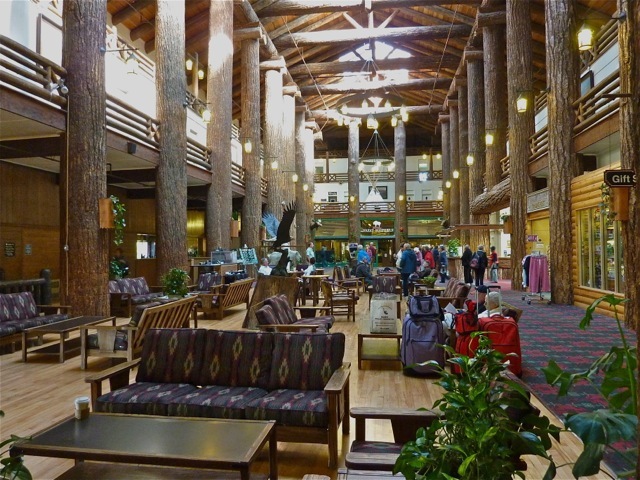 For over a hundred years park visitors have walked into the lobby of the Inn and gaped at supporting columns that, like those in the Glacier Park Lodge, were constructed of whole trees. But in the case of the Old Faithful Inn, the trees used were tall, slender lodgepole pines. Reamer sought out gnarled specimens and used them angled support beams. Felled in Yellowstone and transported just a few miles, the trees were erected, bark still on, to form the bones of the Inn’s great hall. They have since been stripped smooth, but the lobby of the Inn still evokes the feeling of being in a forest. The steeply-pitched roof—also made of lodgepole logs—soars 75 feet overhead. Small, asymmetrically-placed windows high in the walls bring dappled sunlight down to the lobby floor. A vast fireplace and chimney featuring eight distinct hearths lies off-center in the square space. Its irregularly-cut blocks of volcanic rhyolite were quarried in the park. Today, building projects would never be allowed to use timber and stone from within a national park, and I think that is as it should be. But the use of native materials permitted the construction of buildings that fit into their homelandscapes in way that makes them true objects of beauty, and I am grateful for this gift from a century ago. 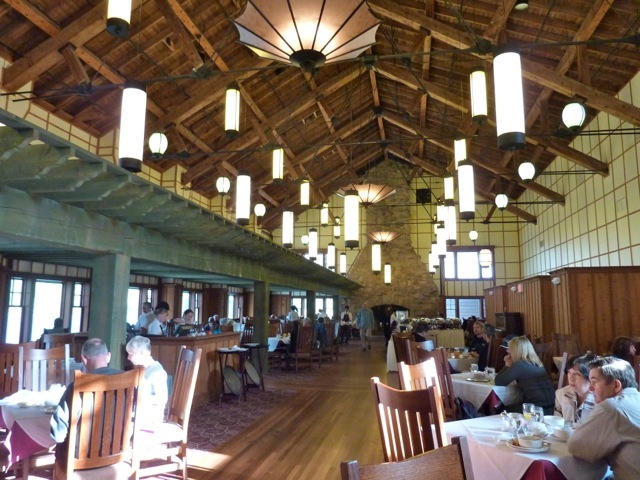 I have visited, though never stayed in, several other historic park lodges: the Ahwahnee in Yosemite Valley, the Zion Park Lodge, and the Grand Canyon Lodge on the North Rim, to name a few. I’ve spent a few nights at the stately Prince of Wales Hotel in Waterton Lakes National Park, the Canadian sister to Glacier. There are numerous other well-known park lodges that I have not yet seen, such as El Tovar, on the Grand Canyon’s South Rim; Paradise Inn at Mount Rainier; the Crater Lake Lodge; and Oregon Caves Chateau. I hope my travels bring me to all of them, in time. National parks are famous for preserving spectacular natural features, but they preserve valuable cultural treasures as well. What are your favorite historic park structures?